For serious writers who care more about getting good ideas out of their heads and onto the page (and not-so-serious writers who just need to concentrate better), all Microsoft Word's fancy formatting features can be more hindrance than help. So, for that matter, are all the menus and distracting layout options. To keep your mind on your thoughts, I recommend distraction-free writing tools. Of course, once you capture your thoughts, you'll probably want to use Word to format them and save them in a format all your colleagues can actually use. Fortunately, there's Write Space, a killer little plug-in that adds an old-school distraction-free editing screen to Word 2007. Launch Write Space from Word 2007's ribbon menu, under the View tab. Whenever I write about distraction-free writing tools, some smart-aleck always says "Why don't you just maximize the Word window?" Here's why: Even when you maximize Word and hide your Windows Taskbar, your view is surrounded by distractions. The Word interface itself is a distraction. To really understand the power of distraction-free editors, you have to spend some time writing in one. To get started with Write Space, download the Write Space installer and run it. Then launch Word. Under the View tab, you'll find a Write Space box with two icons in it: Write Space and Options. Clicking Write Space takes you into distraction-free mode. Clicking Options gives you a few drop-down menus to change your fonts and set the language of the spell-check dictionary. That's it. Super simple. Just as it should be. 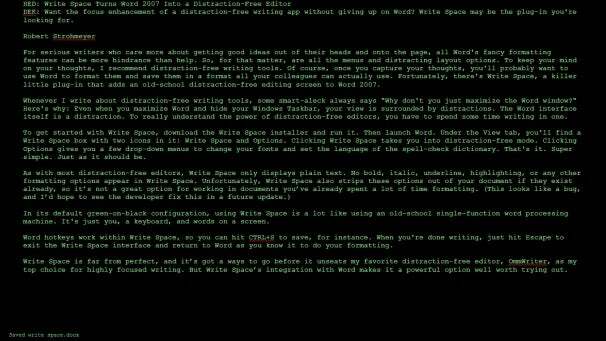 In its default green-on-black configuration, using Write Space is a lot like using an old-school single-function word processing machine. It's just you, a keyboard, and words on a screen. Write Space supports several common hotkeys, so you can hit CTRL+S to save, for instance. When you're done writing, just hit Escape to exit the Write Space interface and return to Word as you know it to do your formatting. Write Space is far from perfect, and it's got a ways to go before it unseats my favorite distraction-free editor, OmmWriter, as my top choice for highly focused writing. But Write Space's integration with Word makes it a powerful option well worth trying out.